I've been using Fedora 15 for about a month now and thought it was time to write up some of my experiences with the new Gnome 3 desktop, since certain aspects are quite a bit different from the previous version. 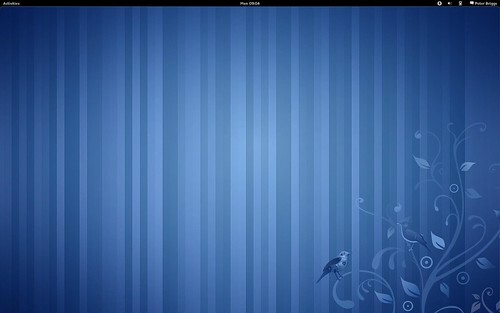 I know other people have posted details about the Fedora 15 desktop (for example Xavier Claessens' One Week with Gnome 3) but when I first installed it there didn't seem to be much from a "user basics" perspective. So this is my take, hope it's useful. 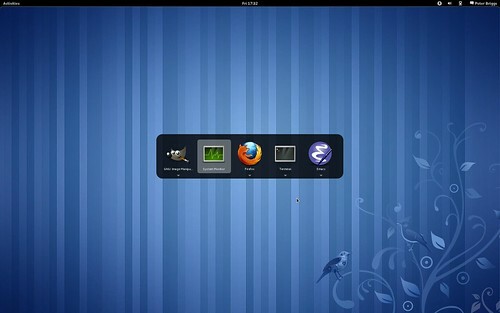 Figure 1: "Empty" Gnome 3 desktop on startup. No desktop icons allowed! 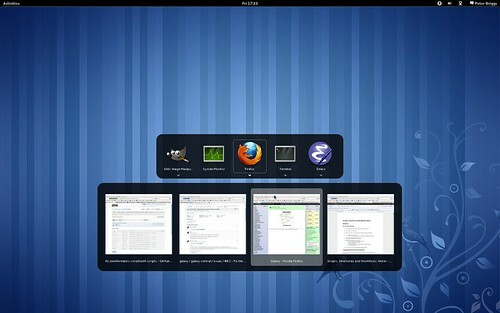 Figure 2: "exploded view" of the Gnome 3 desktop, accessed either by moving the mouse over the "Activities" hot corner (top-left of the screen), or by hitting the "Gnome" (i.e. Windows) key on the keyboard. The Favourites sidebar sits on the left edge of the screen, and the edge of the Workspaces sidebar peeks out on the right. In this view (figure 2) you can see the Favourites sidebar on the left side, and just the very edge of the Workspaces sidebar on the right (more about those below). I call this the exploded view of the current workspace, since (as in this example) features minatures of any windows in the workspace. The exploded view can also be toggled by pressing the "Gnome key" "Super key" (i.e. the Windows key). This shows all the applications installed on the system, with a search box and category groupings on the right to help you find the one you want. Drag icons from this view to the "Favourites" bar to make them more easily accessible in future. The "Add/remove software" application is a graphical front end to yum for installing and managing additional packages that are weren't included by default. The Favourites sidebar is the strip down the left-hand side which holds various application icons. These icons do "double-duty": if you've dragged an icon there from elsewhere (essentially "favouriting" it), then it initially acts as a launcher for that application; also the icons for any running applications (favourited or otherwise) will appear here. Figure 4: The "Favourites" sidebar with dialogue (i.e. the black bubble) opened for Firefox after right-clicking on its icon. This gives options to move to a running Firefox window, or to start a new Firefox instance. Figure 6: ... and arrow keys allow you to select a specific instance if there are multiple instances of a particular application. Workspaces provide a way to manage applications, by giving the user multiple virtual desktops. These should already be familiar to seasoned Gnome users, but they operate somewhat differently in Gnome 3: there are no longer a fixed number of workspaces, instead they are created and destroyed automatically by the system as required. 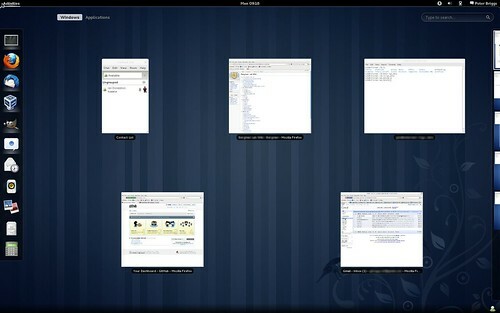 Figure 7: the Workspaces sidebar "popped out" on the right of the screen in the exploded view of the Gnome 3 desktop. 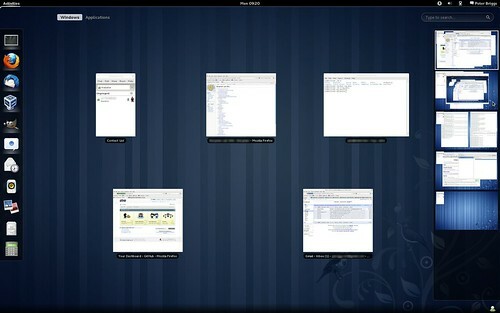 The sidebar shows miniatures of each workspace, with the current workspace highlighted with a white outline. Clicking on one of the images takes you to that workspace; you can also drag application windows between the different workspaces. Note the sidebar also shows an extra "empty" workspace at the bottom: if an application is opened or moved into this workspace then a new empty workspace is automatically created underneath. Furthermore, there's only ever one empty workspace - so if a workspace "empties" (e.g. 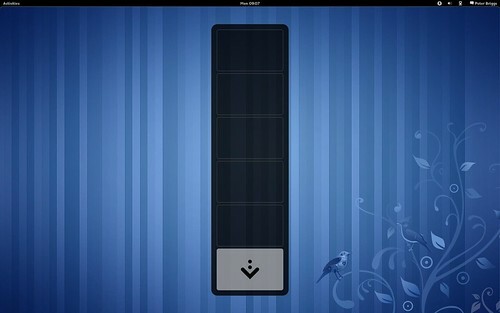 because you've closed all the applications it contains) then Gnome automatically removes it. This can be quite disconcerting, and is probably the feature that causes me the most confusion in practice as it often upsets my sense of where I am in the workspace order. Resizing windows: windows can be maximised by double-clicking on their title bar (double-click again to restore to the original size). There's no "minimise" button on the window frame, so you now have to right-click and then select the "Minimise" menu option. Also, note that dragging a window to the top of the screen automatically causes it to maximise (again similar to Windows 7, and not always what you intend). Manual resizing is also possible as always, by dragging the window edges - but this can be fiddly, as the area where an edge can be "caught" for dragging seems to be quite small. System notifications: these now pop up rather discreetly at the bottom of the screen, but interacting with then can be frustrating at times - often they disappear before you have a chance to read them, and sometimes (counterintuitvely) disappear when clicked. Customisation: while some preference-type options are available via the "username" menu (top right-hand corner of the screen) under "System Settings", overall the customisation options feel quite limited (for example, no screen-savers). However as a number of interfaces to system tools currently only seem to be accessible by launching from a command line, it's not clear if this a conscious design decision or whether more customisation options will be exposed in future versions. Fallback mode: this is a half-way house between Gnome 2 and Gnome 3, and is started by default on systems which can't support the full Gnome 3 experience (which appears to include virtual machines). However as it's much more like the old Gnome, if you really don't like the new version then you could try using fallback mode instead. Having been using Fedora 15 and Gnome 3 day-to-day for a few weeks now, I'm now largely used to its quirks and finding it overall a perfectly serviceable working environment - for me the new workspaces model and the rather random system notification mechanism have proved to be the most challenging differences from previous versions. So while it may not suit everyone's tastes it's definitely worth trying (and hopefully the more egregious foibles will be ironed out in future versions). In addition to using Alt+tab and the arrow keys, one can also use Alt+~ (tilde). When used directly, this switched between windows of the current application. When used together with Alt+tab, this switches between the selected application (similar to using the arrow keys). It's actually Alt+'the key above tab', for non-US keyboards. Thanks for this neat tip (and for noting the differences for non-US keyboards - I've got a UK one), it works a treat for me. Appreciated!